The good news is this camera is a game changer for Arri. It looks like a real winner. It has to be, because they’re now competing with the Sony Venice, which is a really, really great camera. Not to mention Arri lost a lot of ground by not coming out with a compact large format camera sooner. They’ve got a lot of catching up to do. Apparently the camera will not do Super 35 but Arri promises that it eventually will. They have solved the power consumption issue that made the Alexa LF a power hungry hog, and let’s not forget the girth and weight of that camera. The bad news is that everybody who bought the original Arri Alexa LF is not getting a trade-in value or any love from Arri to date. Arri claims that the Alexa Mini LF is complementary to the larger Alexa LF. I don’t quite see how this makes sense. I ordered two Arri Alexa Mini LF’s from Abel Cine at 8:30AM the day the camera was announced. From what I understand, we should receive ours in the first round of releases. This camera is going to give the Sony Venice a run for it’s money. I’m sure it’s immediately going to be wildly popular with Netflix and Amazon for shooting TV series and feature films. 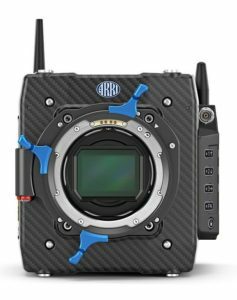 The other exciting thing about this camera is that it looks like Arri has figured out how to reduce the Arri raw uncompressed file size by up to 40 percent. Arri changed everything as it relates to how the new mini LF records. They’ve moved over to recording to the new Codex Compact Drive 1 TB, for fast and open workflows. Also very exciting is the new MVF view finder. I cannot wait to see it at the NAB Show 2019 as this view finder looks amazing. Sound guys will be happy with the new audio connectors, they seem like a great improvement. Another great improvement is the 12 V and 24 V power outs on the camera. What’s puzzling is what do they mean by ‘best overall image quality with much higher usable sensitivity’? I thought this camera had the same sensor as its big brother, the original Alexa LF? Very puzzling. Maybe I’m missing something? I guess we’ll find out in Las Vegas. All these new features, including the finder and six user buttons on the camera’s left side, not to mention a sensor that seems like it might be superior to the sensor in the original Alexa Mini, means that anybody (whether they’re shooting large format or super 35) is going to request this camera over the original Mini. That’s bad news for rental houses. The price of the new Alexa Mini LF is basically the same as the original Mini. I guess that’s going to hold sales on the original Alexa Mini pretty darn quick.